You won’t find paint tubes or sticks of charcoal in Matt Gilbert’s studio. Gilbert makes machines. His creations are composed with a 3-D printer, a makeshift mini-machine shop, surplus store items, handmade circuit boards and dark dental floss. Among the pieces in the MFA exhibition isUntitled (Study: Mineral) by Jonathan Sprague. It is a photograph with archival ink on natural rag paper. 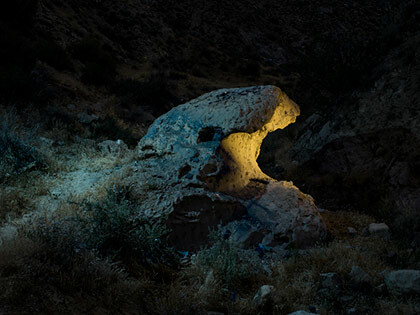 Matt Gilbert’s art, along with that of six other master of fine arts candidates, can be seen in an exhibition June 5 – 21 at theRichard L. Nelson Gallery at UC Davis. You can also view more videos of Gilbert's machines and other art. When he flips the “on” switch, small motors hum and interwoven floss moves, sometimes almost imperceptibly, in a kind of dance. These artworks — both sophisticated and raw — reward the attentive viewer with an unexpected and magical experience. “I experiment with the string and look for a behavior that the material offers, then amplify that into a small colony of activity,” says Gilbert, who is just completing his Master of Fine Arts degree in studio art at UC Davis. Gilbert calls this body of work The Comparative Anatomy of Angels, a name taken from a farcical scientific paper from 1825. “My work has a similarly playful engagement with the scientific imagination,” he says. The title of each piece, Qfwfq #1, #2 and so on originate from a series of stories by Italian journalist and writer Italo Calvino. Qfwfq is a character in the stories who has witnessed every significant scientific event from the Big Bang forward. “The broad range of associations that people find in my work, from the macro to the micro, made me think Qfwfq was a good fit,” he says. Gilbert has been making art and tinkering with electronics since he was a kid. He got serious about art in high school at the South Carolina Governor’s School for the Arts and Humanities and then attended the Art Center College of Design in Pasadena. After graduating, he worked in graphic design in Atlanta where he was also involved in a vibrant music scene that included making his own instruments. Among these were a computer keyboard mounted inside wooden needlepoint hoops, played by rolling a tube filled with nails over the keys, and a hand-cranked coffee grinder outfitted with electronics. He began making non-sound oriented pieces shortly before arriving at UC Davis, creating kinetic sculptures that mimicked the movement of insects. “The challenge was to do kinetic work that wasn’t overly planned or engineered that had a sense of discovery,” he says. Given his background, it’s not surprising that Gilbert is still involved with music and rarely misses a music department concert of contemporary work. Last summer as a recipient of a Margrit Mondavi Summer Fellowship, he spent time at contemporary art and music centers in France. He also visited prehistoric cave paintings where the artists made their art in spots where sound was most amplified and clear. 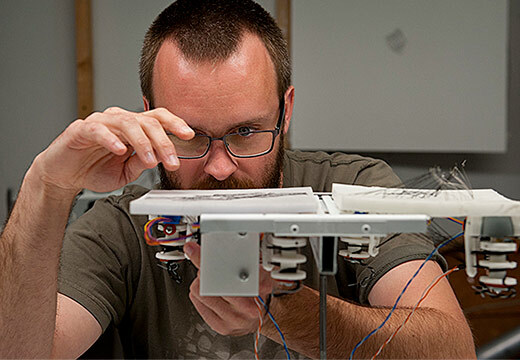 The fellowship also allowed him to attend a workshop at Stanford’s Center for Computer Research in Music and Acoustics to work with professor Jonathan Abel to develop a filter that reproduces the cave’s acoustical qualities. He used the filter in a collaboration with composition student Gabriel Bolaños for a vocal work performed this spring by the UC Davis Early Music Ensemble. “I like to make each project an opportunity to learn a different skill and to experiment with a different medium often in collaborations with other artists,” Gilbert says.